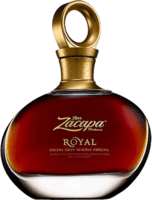 Have you found an online vendor selling Ron Zacapa 23 Solera? 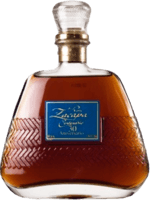 Ron Zacapa 23 Solera Rum was created in 1976 in the highlands of Guatemala, where it is distilled from fresh cane juice before aging at 7544 feet at 62 °F (17 °C). The 500 year-old Spanish Sistema Solera method is used to age Ron Zacapa 23 in white oak casks. This results in a combination of rums aged between 6 and 23 years. 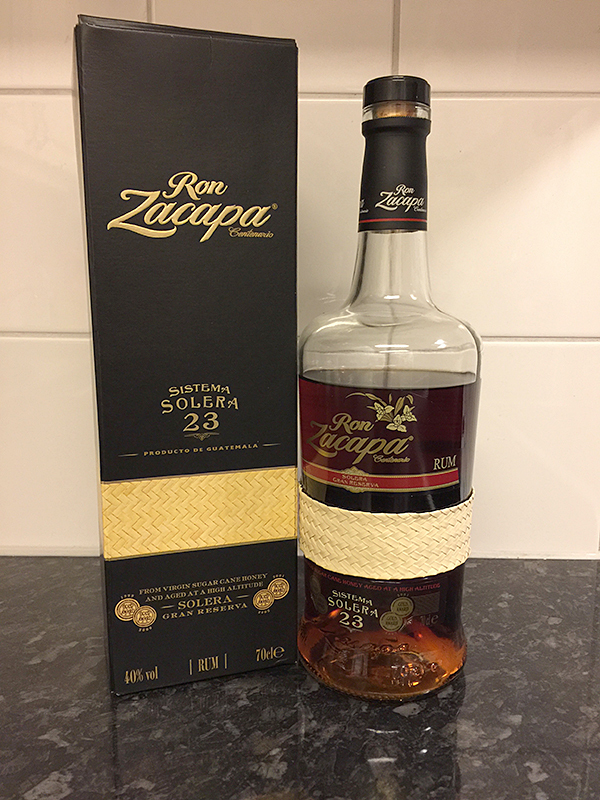 The current Ron Zacapa 23 bottle features a woven band around the middle, which is in reference to the original hand woven palm leaf petate bottle cover that covered the bottle. Without breaking the bank Solera 23 is one of the best out there. Not too strong, full of flavor, and smooth. An excellent choice for someone wanting to try something new. Yes it tastes great. No it is not a genuine aged rum. The XO version is IMO less sweet and more what this rum should be, but the 23 has been sweetened to make it more appealing to the American palate. Also, this is not a 23 yr old rum, it is a Solera blend of aged rum the OLDEST of which is 23 yrs, the average age is closer to 6-8 years. The "z" rums - Zaya, Zacapa, Zafra - as well as Diplomatico and others have led people to believe aged rums should be sweet and smooth, while drier genuine rums - Appleton 12 yr, Mount Gay extra old, Flor de Cana, Seales 10 yr, any agricole rhum - are more indicative of what rum SHOULD taste like in its unaltered state, but less appealing to most people's palates. I am even beginning to think that my favorite El Dorado rums are sweetened, though it is less dominant and actually compliments the robust flavors of the Demeraran rum. The same could be said for Zaya and this one, though IMO the sweetness is considerably more forward. The Zaya and zacapa are robust enough to still be interesting, while Diplomatico Reserva and Ron Fortuna 8 yr both taste flat and boring to me. Ron Fortuna 8 yr is the worst offender yet, nauseatingly sweet and bland. Both probably were decent subtle rums before being sweetened within an inch of their lives. Edit : I have recently come across some info on a Swedish national site that discloses added sugar in rums. This rum formerly had 45 g/ltr of sugar added, which - along with El Dorado 12 yr - was by far the most of any rum on the list. It has recently (no idea when) been reduced to 20 g/ltr. I finally got my hands on Ron Zacapa 23... not a 750mL bottle, unfortunately, because they were out, but two 50mL bottles. I went ahead and opened one. Now, I did do something that perhaps might be seen as... erm... wrong? But it works for me and always brings out more flavors in basically any spirit I'm enjoying. In short, I used a Vinturi Spirit Aerator, and used that to pour the rum into one of the Neat Whiskey Glasses (I don't have a specific rum glass... wouldn't mind some recommendations). My dad is basically a scotch collector, and he's been teaching me how to distinguish nose and palate and finish with scotch. I was never very good. I'm okay (not great, but not bad, either) at being able to tell by taste when a scotch has been aged in sherry casks. I can also pinpoint obvious stuff, like smokiness/peatiness, and stuff like that. But I've never been very good at picking out various flavors. With this, I can do it. On the nose I get hints of vanilla, cocoa, and caramel. I've never been a big fan of bananas, and I was expecting that, but I get something more along the lines of plantain, which while I wouldn't say I like, I definitely prefer over banana. I love the complex sweetness of the palate. Caramel is the overarching flavor I get. The plantain comes out again, only in tiny hints, however. I pick up raisin and apricot, as well. And an underlying hint of coffee. And I absolutely adore how this sits on my tongue. It's sugar... which I guess is to be expected. And I love that. This is nothing like those mixing rums I like. They never had a really defined flavor that I could pick out. Just... rum. But this is something else. This rum is as much the base line to critic a lot of molasses rums as well as maybe the easiest entrance to the world of rums. This is absolute crap! I can't believe there are so many people who still believe this to be great rum. It's really just moderately aged stuff combined with a ton of raw molasses and other sweet additives after distillation. I think this rum is responsible for many people thinking 'rum is too sweet'. The fact is this rum is too sweet and far too popular. Let people make their own cocktails out of your average at best rum with out trying to make a pre-batched cocktail like this an ultra-premium rum! You're only hurting the category as a whole. The RZ 23 was a rum I was looking forward to. It have some reputation. Unfortunately it didn't live up to it. I mostly use it for drinks. It can be consumes straight but it's not very smooth or exiting to drink. It's a rum that I won't buy again. While I agree that the solera system hides the true make up of this rum, I think it is quite good regardless of the younger spirits that likely make up the majority of the bottle. The sweetness is actually held back nicely, at least compared to other Spansih style rums as say Diplomatico. There is also a nice touch of oak. I think it stands on ots own merits quite well. The Zacapa 23 comes in a paper box and a very nice bottle with the classical woven band around it (image). On the nose you get some alcohol, toffee, fruit, vanilla, wood and spices. After a while the alcohol disappears and the other flavors gets more intense. In mouth the Zacapa 23 is smooth and sweet with some spice and a lot of vanilla. In the throat the Zacapa 23 is very smooth with a bit of spice and oak at the end. The aftertaste disappears rather quickly. It should be longer. 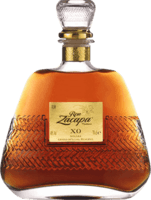 I think that the Zacapa 23 is a very good and price worthy sipper but I only give it 8/10 because I think the Zacapa XO is a bit better as a sipper. The Zacapa 23 was the first rum I could find myself enjoying, and it has become the benchmark against which I measure all other rum experiences. The flavour is deep, layered, and complex. It reminds me of single malt whisky, with smoke-y and oak-y hints to the dark and spicy rum aroma. So, as a big rum fan I tried this as it is surrounded by a lot of hype. The best conclusion I can make is, if you think this is a good rum, you are not a rum fan, stop drinking rum and go back to single malts. This tastes like a really smooth, sweet single malt. Not bad, but the sweetness seems like 'sweetener' sweet, not sugar or caramel. I did try mixing it too, but it is terrible with cola, terrible with ginger, but not so bad with Copella apple and raspberry juice. I ended up binning it, I would advice vigilance towards others 'rum' reviews if they rated this over 5. All the people who are not accustom to drinking rum, are enjoying Zacapa 23y. It's pretty sweet and not that heavy. It's not my favorite but it's a close second. It's a good rum; probably one of the better ones to start sipping with. Avec le Diplomatico ce Ron Zacapa 23 doit faire parti des meilleurs ventes de rhum Solera et les critiques sont souvent élogieuses. J'ai hésité à commander directement le XO mais je me suis dit qu'il serait intéressant de partir avec ce qui semble être la référence chez cette maison. Je n'en suis qu'à ma seconde dégustation mais pour le moment je suis relativement déçu. Alors ça se boit bien, c'est même assez bon mais compte tenu du prix il y a tellement de choses plus intéressante. Mon El Dorado 15 ans coûte moins cher et offre beaucoup plus ! Je vais caricaturer un peu mais je ne sens que le sucre, le caramel et la vanille... bref la base de tous les rhums quoi. Je n'y trouve pas grande complexité et si en bouche il est plutôt doux je le trouve par contre un poil agressif à la descente. J'attends les prochains verres pour voir si mon avis évolue mais pour le moment je reste sur ma faim compte tenu de sa réputation. I decidet to buy this rum since there is a plenty of good ratings on this rum, but I was very disappointed. On the nose is nice, but in the taste I found something hard defying which my tongue did not liked. Something synthetic bitterish and sharp. I cannot believe this "rum" was once marketed as world's best: Its cheap coloured alcohol with plenty sugar added. Nada mas. I would not serve it except with ice cream. The age statements are a joke, the "rum" is a joke - it is more sherry than rum - and basically it is soo overpriced that it is shameful. I enjoy this rum, has a nice sweet aroma and taste. Very smooth to drink, had enjoy it. Would recommend to give it a try. This stuff tastes like Diet Coke, and yet it's the most popular rum on the website. I don't get it. Nose; Smooth and sweet aromas of dried apricots, vanilla, coconut, oak, chocolate, citrus fruits and sherry. A rich and warm palette. Palette; A pleasant oiliness carrying flavors of subtle spicy oak, a nutty element, brown sugar and molasses. The nose continues in the flavors. Finish; A medium finish where dried fruits, oak, brown sugar and molasses are the most prominent flavors. A small hint of tobacco are also evident. Overall; Smooth and well made but a bit boring compared to rums like Ron Esclavo XO and Rum Company - Old Barbados. A nice rum though. Smooth, a bit sweet. Vanilla and caramel. It was my first intro to good rum, and a favorite in my cabinet. Local shop proclaimed this was his best rum. Tried it along with Kirk & Sweeney and Plantation 5 year. Zacapa turned out to be my least fave. Don't get me wrong - this is not a bad rum by any stretch, just not my favorite. Very smooth, but the combination of flavors left me a little flat. Have since tried the Zacapa XO and have to say that one is fantastic! "The interplay between the wood of the barrel and the liquor contents gives the alcohol its flavour, colour and character..."